Around the world, human settlements are facing increasing repercussions from anthropogenic climate change. Even if we were to imagine that it was possible to stabilize the concentrations of greenhouse gases in the earth’s atmosphere today, a Herculean task that would require all emissions to cease, global temperatures and sea levels would continue to rise for centuries due to the time scale of climate change.1 As such, a now common understanding is that “the irresistible momentum of sea level rise will increasingly conflict with human development patterns and plans for the future.” 2 The impacts from sea level rise alone include: increased damage from extreme weather, storm surges and floods; destruction of ecosystems and property; species migration and extinction; resource, food and water shortages; violent conflicts and human migration. These impacts will affect hundreds of millions of people globally. With the certainty of these looming threats, but uncertainty about their extent or meaning for how we occupy the planet, the importance of proactively designing for a changing climate becomes heightened (Fig. 1). Representation of the amount of population affected by one, two and ten meters [3.2, 6.5 and 32.8 ft.] of sea level rise. In large urban centers, the density of cultural, social and economic value may be high enough to justify the scale and costs of the infrastructure required to protect the existing built environment and way of life. One example of this is the Maeslantkering operable dam constructed in 1997 at a cost of over half a billion US dollars.3 Protecting a port city of six hundred thousand through which a large portion of the Netherlands’ $100 billion of agricultural exports pass each year, easily justifies the cost to build and operate the Maeslantkering.4 However, for the majority of coastal and lowland areas, migration or adaptation are more realistic options, although they are much more complex processes than the construction of large engineering projects like the Maeslantkering. Migration and adaptation extend well beyond a specific building site and require a broad range of existing issues to be dealt with in addition to the impacts from sea level rise. They are also sensitive undertakings that must respond to local infrastructure, culture, regulations, economics and the irrationality of humans who tend to be reactionary instead of pro-active (Fig. 2). Causes and impacts of and exposure and barriers to sea level rise and climate change for coastal settlements. To devise solutions to the complex problems coastal regions will be facing as a result of sea level rise, we need to shed our initial instinctual reactions. We must expand the area of inquiry, to expose the true causes, impacts and extents of each problem. We must investigate the tools and resources available for implementation, the regulations that frame the limits of our solutions, and the social and political context and capital that surround the project. In the past, architects have embraced the challenge of solving complex problems similar in magnitude to those we are now facing. Some utilitarian, utopian and social architecture, landscapes, and planning during the latter part of the nineteenth and the first half of the twentieth century responded to the challenges presented by the rapidly changing social, technical and political world. Landscape projects such as Fredrick Law Olmsted’s “emerald necklace,” which was constructed in Boston, addressed the need for relief from overcrowding, pollution, and city noise by creating public urban parks. As part of the solution, constructed landscapes, like these reshaped topographies serve to fix a network of drainage and sewage problems further improving the health and resilience of their cities. Modernist social housing and planning by architects such as Le Corbusier, responded to the complexities of changing social and technological norms, economic disparity, pollution, and urban vulnerability to fire and disease. Although the success of these and other projects of the past can be debated, there is no arguing that the minds behind them generally carried a broad sense of ambition and agency. Contemporary theorists such as Keller Easterling argue that in addition to the common definition of infrastructure, everything from shared standards in construction materials and credit card dimensions, to shared ideas that shape policies, physical space and human interactions are all forms of infrastructure.5 Re-examining complex projects of the past such as those of Olmstead and Corbusier with this contemporary definition of infrastructure shows that these were much more than architectural or landscape designs. Their design solutions used organizational infrastructures, standardized construction materials, and social infrastructure to create frameworks flexible enough to address the complexity of the issues they were responding to. “Polyvalent Adaptation” 7 provides a new approach to infrastructure capable of tackling the scale, complexity and temporal aspects of the issues the world is facing today. This approach combines two concepts that are not new to the profession or to discussions surrounding the topics of sustainability and climate change, but when married amplify each others’ potential. What allows these two concepts to mesh so seamlessly is that both “polyvalence” and “adaptation” are ideas with “process” at their cores. In addition to this, each also addresses the fundamental flaws of the other. “Polyvalence” is the inherent capacity of an object to be reinterpreted for different uses over time. Dutch architect Herman Hertzberger first introduced this concept to the architectural profession in the 1960s as a criticism of the inherent laissez-faire in the idea of flexibility. In Hertzberger’s words, “although a flexible set-up admittedly adapts itself to each change as it presents itself, it can never be the best and most suitable solution to any one problem.” 9 The idea of polyvalence can also be perceived as a response to the egotistical approach of utopian designs, which are typically theoretically strong, but in their specificity turn their backs on the diversity and irrationality of humanity. Hertzberger argues that “just like words and sentences, forms depend on how they are ‘read’ and which images they are able to conjure up for the ‘reader’.” 10 To be reinterpreted a form requires sufficient defining characteristics, as well as a context suggesting the need for reinterpretation. The Athenian Agora is one excellent historic example of constructed polyvalent buildings and public space. The Agora has evolved over several thousand years as each new building positioned itself relative to the existing buildings. The colonnades, steps and variety of spaces for circulation and access to buildings have consistently been used as seating, shelter, and meeting places, accommodating the quiet observer and those needing to be the center of attention. The result is a public space that has been continually re-interpreted for civic theatres, markets, special events and circulation (Fig. 3). Plan of Athenian Agorá in 400 BCE, 100 BCE and 100 CE. An unintentional example of a polyvalent building is the Tower of David in Caracas, Venezuela, which was originally designed as an office tower. A financial downturn coupled with housing demands led to the illegal habitation of the unfinished tower as a vertical residential neighborhood. The concrete structure and vertical infrastructure were reinterpreted as a physical representation of Le Corbusier’s un-built Plan Obus in Algiers, which suggested that individuals could build houses on levels of raw structural platforms. Polyvalence - it could be argued - became a means to focus the idea of flexibility towards a targeted range of future interpretations. However, without at least a vague understanding of the future context within which a polyvalent design will be reinterpreted, or a timeframe, the designer is left with too many future possibilities. This results in designs that are either too focused towards an imagined future, or are so vague that they revert back to the tactics of flexibility that polyvalence was intended to avoid. Additionally, infrastructure may also be wrongfully designed as polyvalent in the case where reinterpretation is not likely within the lifetime of the project. Alejandro Aravena’s low cost social housing in Quinta Monroy, Chile, is an excellent contemporary example of an intentionally polyvalent architectural design. 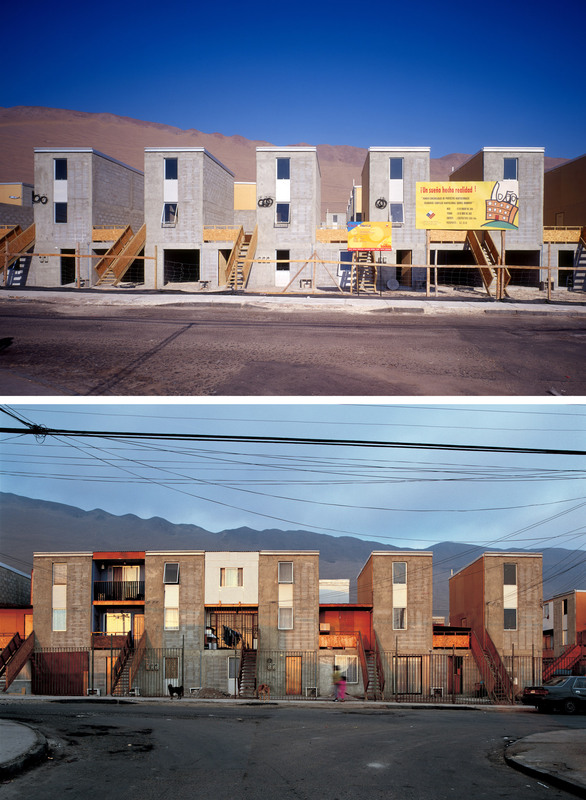 Responding to a need to build social housing for one hundred urban families within a budget of US$750,000, Aravena reframed social housing not as a government expense, but rather an investment. What resulted was the design of a row-house typology where only a portion of the shell and floor structures of each of the three-storey houses was constructed. This allowed the minimum social housing requirements to be met while providing a framework to guide the design and construction of future additions and renovations as each family consolidates the resources to do so. This approach provided a base-line to assist in guiding future possibilities while not dictating future construction. Although controversial, the success of the Quinta Monroy housing project has lead to the construction of other projects that build off this initial design 12 (Fig. 4). As the impacts of climate change and resource shortages increasingly influence the design of the built environment, the discussion surrounding the concepts of flexibility, reinterpretation, and re-useable architecture should continue to gain attention. Words such as “future proofing,” “contingency,” and “sustainability,” are frequently thrown around, not only by designers, but by corporations, governments and citizens alike. As designers of relatively static objects that are generally animated through human use, the concept of polyvalence has the potential to provide architects with a valuable perspective towards producing designs that stay relevant as our climate changes. But what is required for polyvalence to be successful and focused is an understanding of the changes that are taking place, as well as verification that the timeframe for those changes is relevant to the lifetime of the building and its users. Quinta Monroy social housing in Sold Pedro Prado, Chile. “Adaptation” is defined as “a process whereby an organism becomes better suited to its environment.” 13 As a process, the timeline for adaptation falls between the glacial multi-generational progress of evolution, and the immediate instinctual reaction to an emergency. Adaptation requires an understanding of the changes to which it must respond. What is also important is that the timeline during which the change will take place is either a significant portion of the lifetime of the organism or potentially, in the case of humans, multigenerational. However, where adaptation to climate change becomes a challenge for the architect is that buildings and in many cases infrastructures are static objects. So the question becomes how can our new buildings and infrastructure be designed and constructed so that they can adapt to our uncertain high-risk future? In the context of climate change, Polyvalent Adaptation provides a multi-layered lens where each layer addresses the fundamental flaws that the other lens displays in isolation. Where adaptation breaks down is the relatively static reality of the built environment. How does something permanent become adaptable? This is where the re-interpretive qualities of polyvalence can provide direction. Where polyvalence falters is that it requires defined future changes, and a timeline for those changes that is relevant to the infrastructure being reinterpreted. 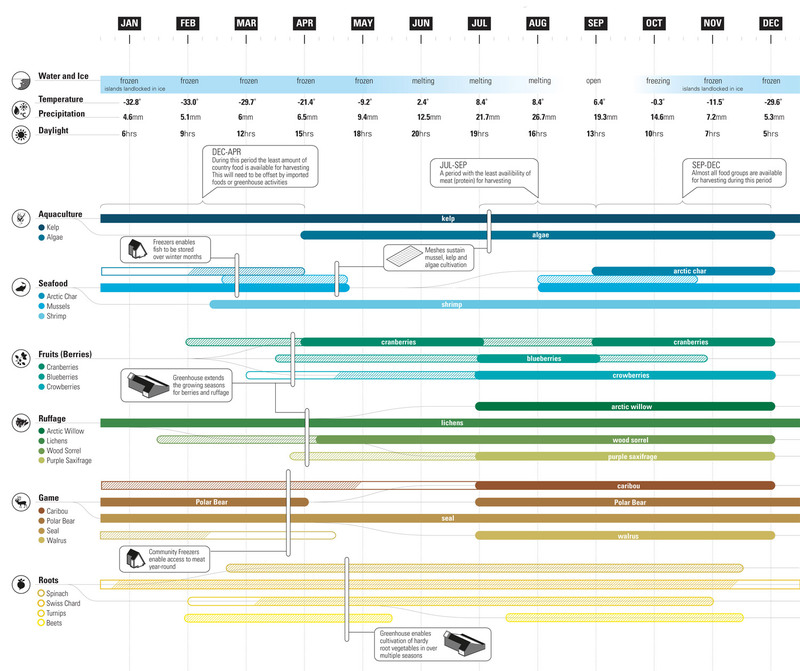 Adaptation to climate change can provide a timeline and potential changes to make polyvalent designs more successful. Polyvalent Adaptation presents the idea that infrastructure, with minimal or no customization, can be reinterpreted at different periods in time to meet the needs of that time. Although two or more reinterpretations of any given infrastructure are possible, climate change typically suggests three interpretations: one that responds to the present context, one that responds in the moment to extreme weather events, and one that supports future possibilities. As is the case for everything built today, the design of infrastructure is a response to a defined set of current needs or wants. This initial interpretation of a piece of infrastructure is the most obvious and is therefore the easiest to design for. It has historically garnered the most attention in the allocation of budgets, the generation of design briefs, and during the design process. In a society where neoliberal economic values and short term thinking and planning are the norm, this first interpretation provides justification for the initial investment to design and build polyvalent infrastructure. As our climate continues to change, one of the major impacts is the increasing intensity and frequency of extreme weather events such as storm surges, hurricanes, floods and droughts. Following any of these events, infrastructure has the potential to be reinterpreted as an emergency resource, cache, or shelter. As the discussions around contingency in design are increasing, this second interpretation can also play a role in justifying the investment in the infrastructure (Fig. 5). The final interpretation of the polyvalent infrastructure is as a spine to allow for and promote new settlement patterns. In this interpretation, the infrastructure acts as a support mechanism or magnet whether individuals, families or communities decide on their own to adapt or are forced to by an extreme weather event. Just as people were drawn to current coastal zones and cities due to natural infrastructures such as water, good soil, transportation and resources, new populations can be drawn to new constructed ones that provide a framework for a way of life that continually adapts to the changing climate. Polyvalent Adaptation for coastal population. As the built environment struggles to keep pace with the rapidly-changing world, Polyvalent Adaptation should be at the forefront of the architectural discourse. Used as a lens, Polyvalent Adaptation presents opportunities for us to create temporally relevant infrastructure that addresses current and future problems while also mitigating risks. However, as pressing as climate change issues are, the current process for developing designs is generally not equipped to produce designs that have the built-in agency or contingency required to address the scale and impacts of climate change. Although some architectural offices have figured out ways around this limitation, for the most part specialized firms develop specific programs and define tight budgets, often with political or economic agendas driving them. 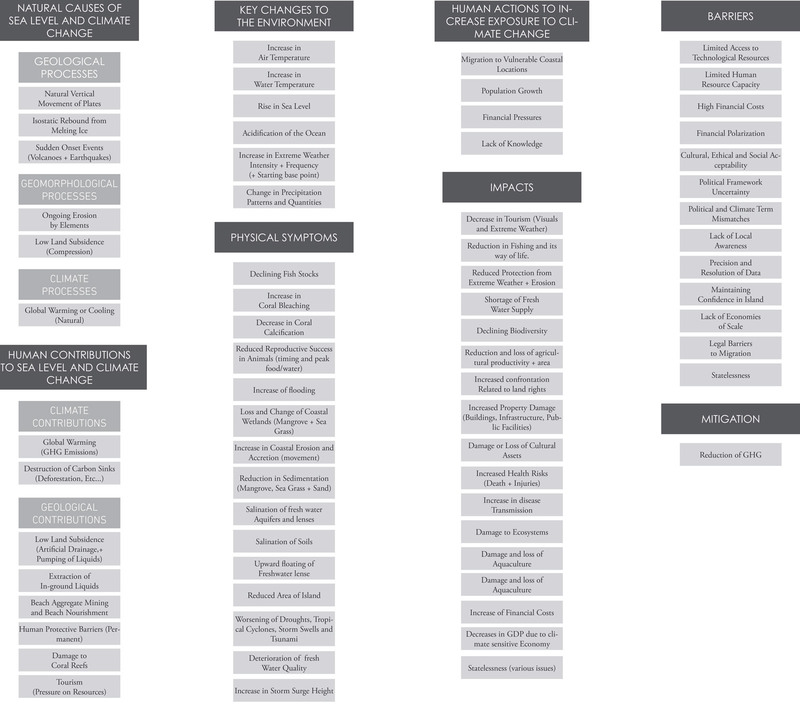 Then, based on these programs and budgets, architects compete in order to execute designs in restrictive regulatory and planning frameworks, many of which are decades old and a response to different times. The world is littered with projects that are over budget, behind schedule, and, almost before completion, inadequate for their intended use. This straightjacket of the contemporary design process is reinforced by a lack of continuity and foresight resulting from short political terms and quarterly financial expectations of privatized entities. Architects are caught between the realities of climate change, outmoded disciplinary norms, and the financial and regulatory limitations of neo-liberalism that are driven by economic greed, not social or environmental well-being. To tackle the scale and impact of sea level rise, we need to rethink the foundations of the design process and the organizational infrastructures that define that process. If we look again to the work of Le Corbusier and Frederick Law Olmstead, we can learn from the context within which their projects were proposed and implemented. Two key elements become apparent. The first is ambitious designers, willing to expand their thinking beyond the confines of their profession and the initial problem; the second is the power and resources to implement radical ideas. These two characteristics are present in many other complex infrastructural projects from our past as well. In Paris, the ambitious plans of Napoleon III, which were amplified through Haussmann’s design, were implemented through the centralized power that Napoleon III wielded. In the Netherlands, the initial ambitious designers of dikes were individual landowners who were drawn to the fertile soils of the area. Over time, the homogeneity of the Dutch society surrounding dikes has provided the power to implement and maintain water management infrastructures at the scale of the entire country. Through the lens of Polyvalent Adaptation, the architect is well equipped to develop the required ambitious designs. Architect Reinier De Graaf argues “in as much as we are specialists, we are specialists at everything - which defies the point of being a specialist.” 15 It could be argued then that architects have value as generalists. We are able to bridge between areas of specialization as well as to clients, the end user, and local communities in order to orchestrate a physically constructed project. If we include architecture and organizational systems in the definition of infrastructure, architects can expand the reach of our complex problem solving to draw on our specialization as generalists. This brings added value to the role of the architect and creates an environment more suited to the creation of the polyvalent designs that will assist in our adaptation to the changing climate. The second key element is the power and resources to implement a design. The banding together of communities in the devastation following extreme weather events, or due to the increasing threat of similar future events, has the potential to yield the power and resources required for implementation of polyvalent designs of various scales. The power and resources resulting from extreme events can manifest in many different ways, one of which is rebuilding exactly as before, however, there are other recent examples that suggest other potentials for this power. One example is the enhancement of crowd-sourcing and crowd-funding through improved technology and social networking. These approaches have both been used as early as the eighteenth century,16 however the internet has provided the platforms and connections required to break down the geographic, logistical and social barriers that have previously limited the potential of the crowd. Both crowd-sourcing and crowd-funding have demonstrated that large scale projects, in ambition and cost, can be pioneered not only by governments or corporations, but also by groups of citizens. Although there are few examples of proactive crowd-sourcing and crowd-funding within the field of architecture, there are many examples of people banding together to support communities or individuals following extreme events. Another recent example is Rebuild by Design. The United States Department of Housing (HUD) created Rebuild by Design as a response to damage caused by Hurricane Sandy in the north-eastern United States. In its own words, this organization is “reimagining the process by which communities create solutions to complex problems.” 17 The organization connects designers with locals in the areas affected in order to come up with projects and approaches that address local needs while also improving the ability of the region to be prepared for and to adapt to worsening extreme weather. The typical preparation of a program and budget is removed from the process to let multidisciplinary teams of designers research and develop their own projects that will not only rebuild the region, but will also respond to future extreme weather and the new realities resulting from climate change. The projects typically combine social, ecological, physical and cultural responses through infrastructure. The US$930 million of funding that is set aside for these projects 18 has been allocated to the projects based on their effectiveness and ingenuity, creating an incentive for better research, community engagement and design. According to the design documents, “Rebuild by Design occupies a space on the edge of government, philanthropy, academia, design, and community.” 19 This model is currently being proposed in other areas of the United States and has spawned the one-hundred Resilient Cities organization. In democratic societies, this model has the potential to allow large regional-scale infrastructural projects to move forward since they are rooted in the needs of all levels of society. 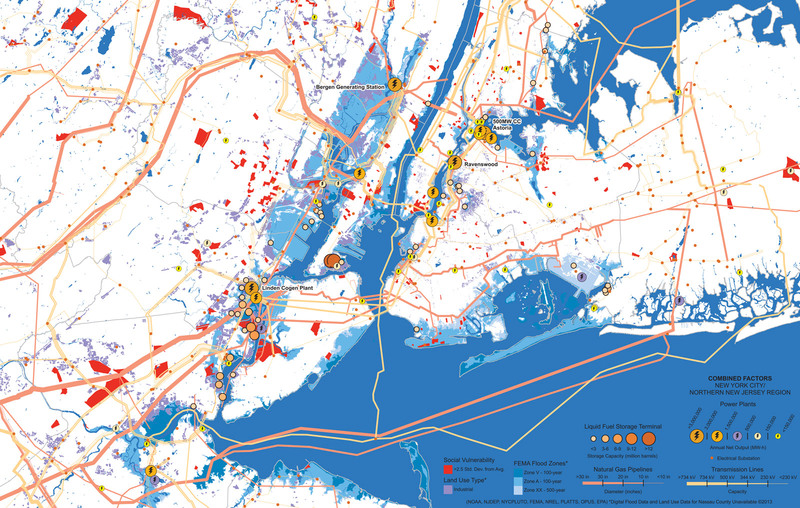 The results of the Rebuild by Design approach, many of which are about to begin construction, demonstrate the potential of rethinking how our projects are defined, funded and shepherded through the required regulatory processes and how this can increase the likelihood of Polyvalent Adaptation, especially in the wake of, or face of, extreme weather events. The following projects demonstrate the potential that the Polyvalent Adaptation approach holds. The three projects range from historic desert oases in Saharan Africa, to a proposal for an Arctic Food Network in northern Canada, and finally a project under the umbrella of Rebuild by Design that is in the process of being implemented in New Jersey. Approximately five thousand years ago, most of the Saharan Desert was green and home to societies that relied on transhumance as a way of life. Since that time the area has slowly transformed into a vast desert as the last water from the ice age evaporated or moved underground, leaving behind depressions with extensive salt deposits and rich soil. An increase in agricultural production and a demand for salt caused the development of trade routes from Timbuktu in the south to the northern coast of Africa, often with a final destination in Europe. 20 Natural oases, “fertile spots in the dessert where water is found,” 21 became vital infrastructure in the functioning of these routes. Gradually, continued desertification caused trade routes to become more difficult to navigate as the number of oases dwindled. By the twelfth century C.E., the construction of foggaras and saniyas meant that new artificially-created oases, providing reliable sources of water, could be created at more frequent intervals and could therefore stabilize trade routes.22 Saniyas are deep wells from which groundwater is pumped. Although relatively stable, they rely on a single source of water.23 Foggaras, on the other hand, are a combination of one slightly sloped horizontal tunnel and equally spaced vertical galleries that stretch up to fifteen km [9.3 mi.] into the landscape collecting water from multiple sources. In some cases, foggaras reach groundwater in surrounding hills, although typically they rely on a combination of rainwater infiltration and condensation. Due to daily temperature swings of up to 20°C [68°F], humid daytime air condenses in the cool air of the night and collects on the ground and in the galleries. This process is reversed during the day when warm air is drawn into the cool foggara through the stack effect of the galleries, and condenses 24 (Fig. 6). Sectional diagram through a typical foggara and oasis. Artificial oases are generally located on the edge of alluvial areas. They maximize the efficiency of water use through their internal relationships and forms. Fed by gravity from saniyas and foggaras, a series of segias (covered small canals) and cisterns irrigate the oases below.25 Ksar (villages) are located at the water source where the cleanest water is found.26 In the ksar, planted inner courtyards (souks) provide exterior public microclimates that provide cool air for ventilation of adjacent buildings on hot days. 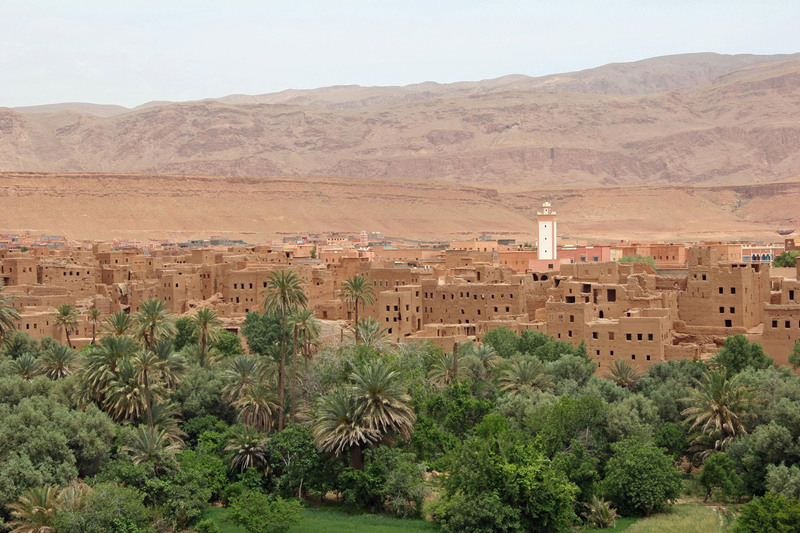 Buildings surround each souk, protecting it from wind, sand and looting.27 Below the ksar, several square kilometres of alluvial agricultural terraces use a system of stratification to create micro-climates that protect their limited water resources while creating ideal growing conditions for crops. The upper stratum is typically date palms, below which a shrub stratum of fruit trees can thrive. The lowest stratum is either used for growing cereal, legume and vegetable crops, or for animals 28 (Fig. 7). Abandoned ksars near Ouarazate, Morocco. Acting as “socio-ecological landscapes,” 29 oases are a combination of organizational and physical infrastructures that unite to provide the micro-climates required to protect humans, food, and water from the harsh desert environment. They have the capacity to provide stability through extreme droughts as their agricultural areas expand and contract in relation to the constant but varying flow from their water sources. Over time oases have been reinterpreted as resource infrastructures and have draw people to them.30 These settlements grew to support and develop cultural spaces, cultural habits and local economies. As our climate continues to change, there is a renewed interest in ancient technologies, design, and constructed ecosystems such as those of oases, that provide the resources and stability required to adapt to living in harsh new environments. Although there are plenty of food resources in the region, the import of expensive, unhealthy, processed food from the south is commonplace, economically unsustainable, and has created tension between the Inuit and the Canadian government. It has also resulted in physical isolation, economic marginalization, decreasing health, youth disenfranchisement and loss of traditional knowledge in the growing population of young people 34 (Fig. 8). Proposed Arctic Food Network on Baffin Island, Ninavut (Canada). Strengthening an existing network of winter snowmobile trails by constructing a regional network of rest stops, hunting cabins, arctic farms, camp hubs and food storage, Lateral Office’s proposal for an Arctic Food Network (AFN) aims to address social, economic, environmental, political and cultural issues in the territory of Nunavut. Each hub is designed and ideally situated to exploit local ecosystems and ecologies for the harvesting, preparation and storage of food. The hubs combine new technologies such as telecommunication, greenhouses and smoking cabins with expanded traditional models, such as fishing cabins and community freezers, in order to increase the capacity of that region 35 (Fig. 9). Calendar showing existing and extended seasonality of traditional foods. Located at a maximum network spacing of one hundred and sixty km [99.4 mi] (a day’s travel by snowmobile), the hubs occupy a series of urban, inland, water, ice and coastal locations near food resources. Designed as kits, the number and type of building on each site would vary depending on context, allowing the project to be “adaptable, cost effective and incrementally deployable.” 36 Constructed using pre-fabricated pieces, each building is designed to be transported to the site on traditional sleds (qamutik). Assembly and disassembly of each building is estimated to take four days using traditional sled construction techniques, allowing for quick deployment or relocation as required 37 (Fig. 10). The proposed AFN has the potential to reduce the dependency of the Inuit on Canada’s South by increasing and diversifying their local food supply and increasing their physical and digital network connectivity. In the case of emergencies or extreme weather events, the network could be reinterpreted as an emergency food cache relying on the number and distance between stores of food for stability and redundancy.40 If one or several of the caches were destroyed, the others could still be used until the system recovered. 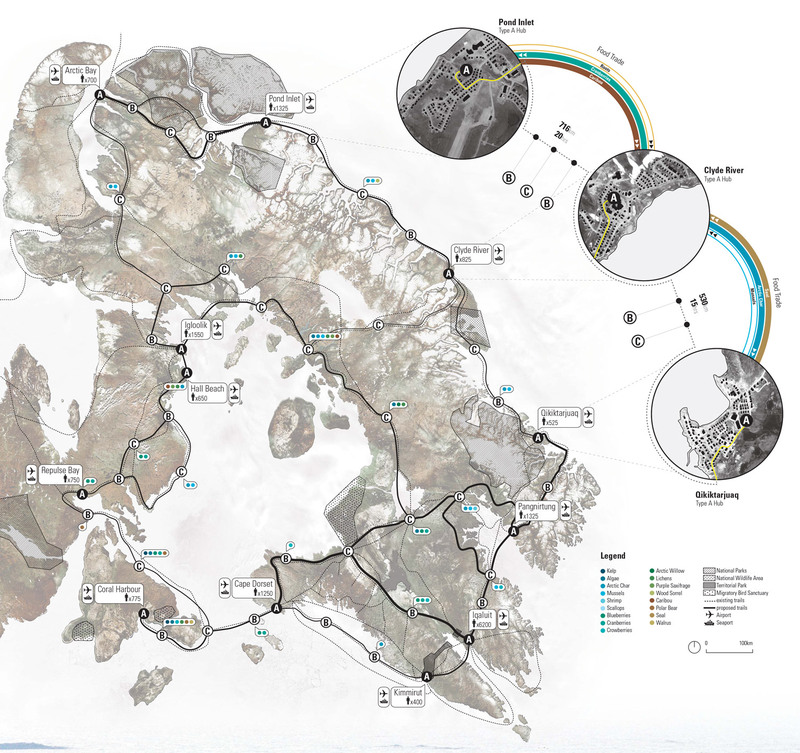 In its final interpretation, the network could become a new spine to suggest and support growth and new settlement patterns for the expanding young Inuit population in the twenty-first century. By using research and data investigation combined with a sensitive understanding of different cultures, Lateral Office produces projects such as the AFN that challenge our notion of architecture by pro-actively inventing or reinventing architectural projects. They use design as a tool to explore, respond and ultimately confront the complexities of our contemporary world. The range of scales within their designs leaves room for future reinterpretation and demonstrates a deep understanding of the micro and the macro aspects of their projects. Their work creates a respectful yet critical conversation that moves across disciplines and cultures as well as vertically through all levels of society. 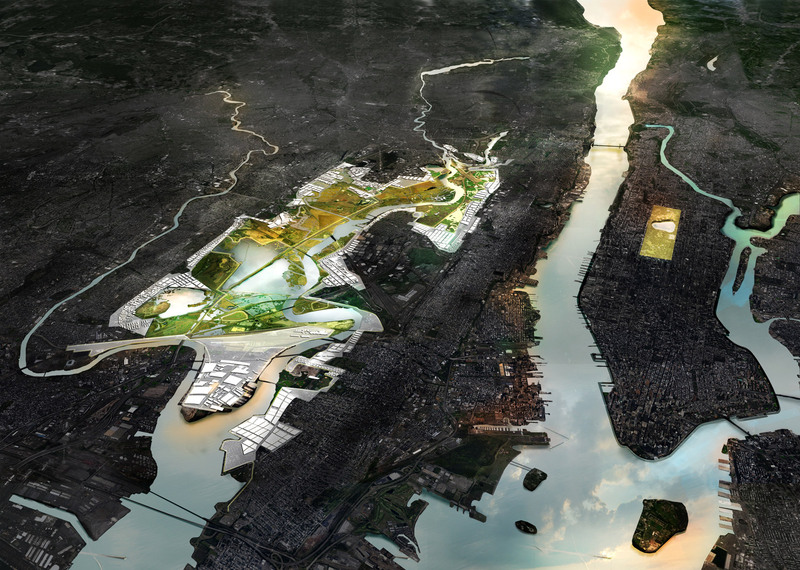 As one of the projects chosen for further development and funding from the Rebuild by Design process, the New Meadowlands project by MIT’s Center for Advanced Urbanism, ZUS and De Urbanisten is an excellent contemporary example of Polyvalent Adaptation. The Meadowlands site, northwest of Jersey City was selected following a larger regional study that layered social, economic, environmental and infrastructural vulnerabilities. It became evident that the Meadowlands area was one of the most critical assets to the region, yet also one of the most vulnerable areas to future storm water surges and sea level rise.41 The design team argues that the “federal dollar is best spent when it helps not just flood risk, but rather the combined effects of flooding, head islands, pollution, social vulnerability and vital network protection” 42 (Fig. 11). Meadowlands as a critical hub. The New Meadowlands proposal is structured around three interpretations of its key “meadowband” infrastructure - connect, protect and grow. Located along the edges of the most densely developed areas, the meadowband is essentially a berm. 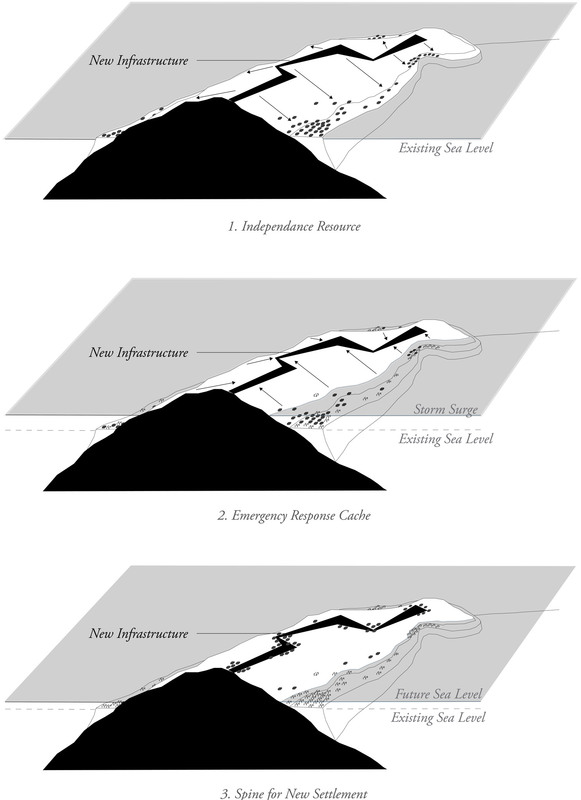 The infrastructural aspects of the berm serve as a missing link that mediates between different ecological and developmental systems, while also transcending project scales.43 In addition to the functional aspects of the berm, it also acts as a visual signifier for the impacts of sea level rise and becomes branding for the overall master plan (Fig. 12). 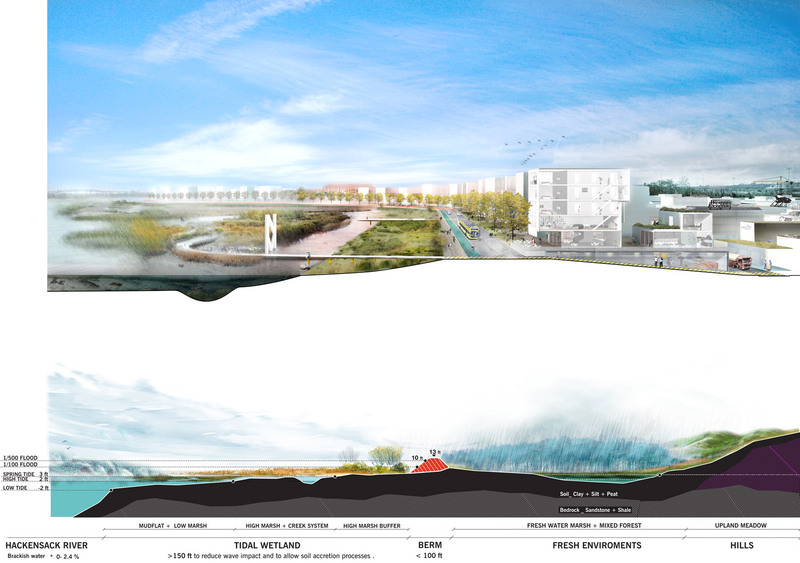 In its first interpretation, the berm addresses many of the current needs of the area by providing local and regional transportation, protecting the wetland from existing urban and waste contamination, re-establishing protected freshwater wetlands, and creating a network of outdoor public spaces. The second interpretation of the meadowband is as a protective ribbon for the urban areas from future storm surges, wave action and sea level rise. This interpretation also provides room for the “meadowpark,” the natural marshes and meadows in the flood plains, to provide its beneficial daily hydrological functions (Fig. 13). The final interpretation of the infrastructure is as a spine to attract and guide future development in the area. Foundational to this final interpretation is what the design team calls “design integration.” Design integration requires that the meadowband respond not only to existing urban contexts, but that it also provide reinterpretable direction to guide, but not limit, future high density development for the area 44 (Fig. 14). Connect, Protect and Grow: an exploded axonometric. Sections through the new Meadowlands proposal. 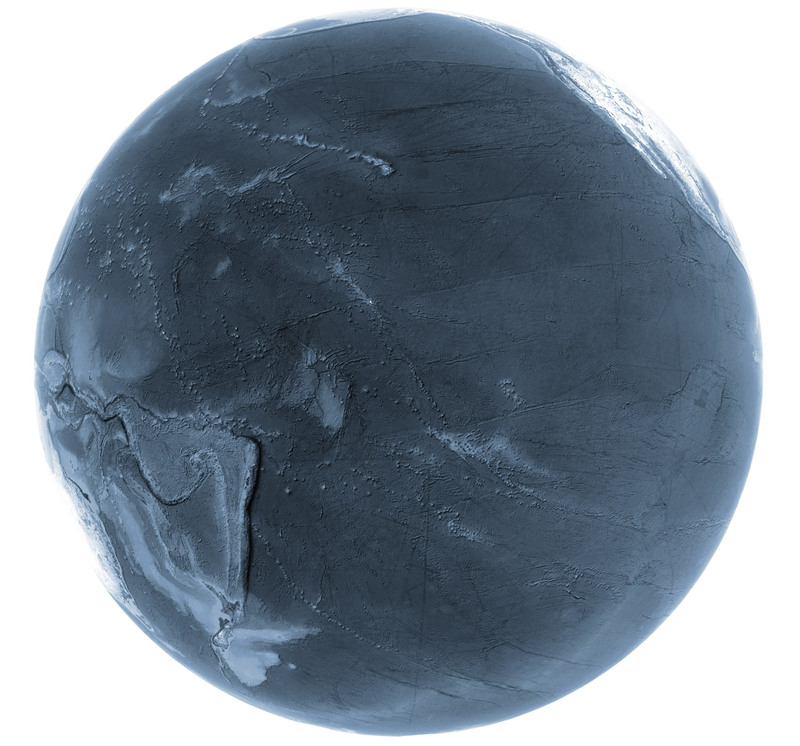 Viewing earth from the Pacific Ocean orientation reminds us that most of the planet is covered in water and ice. The impact of this water on our daily lives, especially in the case of sea level rise, is and will continue to be profound as we enter the new anthropogenic epoch. By using the lens of Polyvalent Adaptation, we can increase the effectiveness of our responses not only to address sea level rise, but also to find solutions to the other interconnected impacts of climate change (Fig. 15). Currently, only a few projects demonstrate the value of Polyvalent Adaptation, and even fewer do so in relation to sea level rise. For the most part these projects are theoretical, but for those that are either under construction or completed, the extent of their success remains to be tested over the next several decades. There is, however, plenty of value that can be drawn from these projects as well as those of varying scales that exhibit similar qualities or characteristics. Identifying and further examining these projects through the lens of Polyvalent Adaptation will provide further insight into the potential of this new approach. A better understanding will help us answer some of the pressing questions surrounding the architectural discipline and its role in responding to climate change. How can our designs become more temporally relevant? What physical attributes will lead to a design being reinterpreted in a new context? What fundamental changes to the design process will be conducive to the development of projects that adapt? At the end of the day, our built environment must be able to balance the large scale of the physical impacts of climate change with the domestic scale of those impacted. It must also meet immediate needs while maintaining the flexibility to respond to a variety of unknown futures. As a design approach, Polyvalent Adaptation has the scalability, flexibility and temporal relevance required to address the complex problems we face. Just as modernism emerged to respond to the social and industrial changes of the early twentieth century, Polyvalent Adaptation has the potential to provide a response to current and future social, technological and environmental changes. Perspective of Earth focusing on the Pacific Ocean. Susmita Dasgupta and Craig Meisner, Climate Change and Sea Level Rise: A Review of the Scientific Evidence, Climate Change Series, Environment Department Papers, no. 118, (Washington DC: World Bank, 2009), https://www.uncclearn.org/sites/default/files/inventory/wb39.pdf. Janin Hunt and Scott A. Mandia, Rising Sea Levels: An Introduction to Cause and Impact (Jefferson NC, USA: McFarland & Co. Inc., 2012). Keller Easterling, Extrastatecraft: The Power of Infrastructure Space (Brooklyn NY, USA: Verso, 2014). This concept was first developed as part of a Masters of Architecture thesis project by the author. Alexander Ring, “Polyvalent Adaptation: Projective Infrastructures for Sea Level Rise & Regional Migration” (master’s thesis, University of British Columbia BC, Canada, 2015). Tim F. Flannery, Atmosphere of Hope: Searching for Solutions to the Climate Crisis (New York: Atlantic Monthly Press, 2015), 135. Herman Hertzberger, Lessons for Students in Architecture, 7th ed. (Rotterdam: 010 Publishers, 2016), 146. Toshio Nakamura, ed., “Herman Hertzberger 1959-1990,” Extra Edition, A+U Publishing (April 1991), 22. Chris Reed, “The Agency of Ecology,” in Ecological Urbanism (Baden, Switz. : Lars Müller Publishers, 2010), 324-29. Oxford Dictionaries Online, s.v. “Adaptation,” accessed September 3, 2017, https://en.oxforddictionaries.com/definition/adaptation. Stan Allen, “Landscape Infrastructures,” in Infrastructure as Architecture, eds. Scott Lloyd and Katrina Stoll (Berlin: Jovis, 2010), 36-45: 43. Dava Sobel, Longitude: The True Story of a Lone Genius Who Solved the Greatest Scientific Problem of His Time (New York: Walker Books, 1995); James McLaverty, “The Contract for Pope’s Translation of Homer’s Iliad: An Introduction and Transcription,” Library s6-15, no. 3 (September 1993): 206–25, doi: https://doi.org/10.1093/library/s6-15.3.206. Ghislaine Lydon, On Trans-Saharan Trails: Islamic Law, Trade Networks, and Cross-Cultural Exchange in Nineteenth-Century Western Africa (Cambridge MA, USA: Cambridge University Press, 2009), 49-52. Oxford Dictionaries Online, s.v. “Oasis,” accessed November 10, 2017, https://en.oxforddictionaries.com/definition/oasis. Lydon, On Trans-Saharan Trails, 54-79. Selma Zerhouni, Hubert Guillaud and Elie Mouyal, L’architecture de terre au Maroc (Courbevoie, Fr. : ACR Edition, 2001), 98. “Traditional Water Management in Arid and Semi Arid Areas: Case Studies of the Gheris Oasis and the Figuig Oasis, Morocco,” Hydria Project, http://www.hydriaproject.info/en/cases/morocco/importance.html. 8 Bureau E.A.S.T. (Takako Tajima & Aziza Chaouni), “Cultured Landscapes,” in Infrastructure as Architecture, eds. Scott Lloyd and Katrina Stoll (Berlin: Jovis, 2010), 88-95: 89. Zerhouni et al., L’architecture de terre au Maroc, 96. Ahmed Karmaoui, Issam Ifaadassan, Mohammed Messouli and Mohammed Yacoubi Khebiza, “Sustainability of the Moroccan Oasean System (Case Study: Middle Draa Valley),” Global Journal of Technology and Optimization 6, no.1 (January 2015), 2-3, doi: 10.4172/2229-8711.10000170. As defined by ethno-biologist Vincent Battesti in: Vincent Battesti, Jardins au desert. Evolutions des pratiques et savoirs oasiens, Jerid tunisien (Paris: IRD Editions, 2005). Karmaoui et al., “Sustainability of the Moroccan Oasean System,” 2. Lateral Office, http://lateraloffice.com/. LATERAL OFFICE, founded in 2003 by Mason White and Lola Sheppard, is an experimental design practice that operates at the intersection of architecture, landscape, and urbanism. Lola Sheppard and Mason White, “Arctic Food Network,” in Food for the City: A Future for the Metropolis, eds. Brigitte van der Sande et al. (Rotterdam: NAi Publishers, 2012), 192-97: 193. Sheppard and White, “Arctic Food Network,” 193. Sheppard and White, “Arctic Food Network,” 195. MIT CAU + ZUS + URBANISTEN, The New Meadowlands (Cambridge MA, USA: MIT Press, 2014). 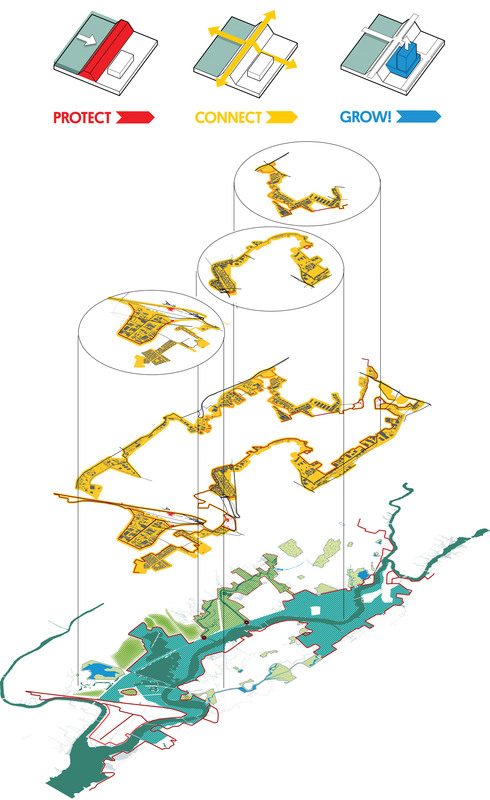 This is a report of the work prepared by MIT CAU + ZUS + De Urbanisten for the Rebuild by Design Competition, http://www.rebuildbydesign.org/data/files/672.pdf. Figure 1: Image provided by the Author, generated with information from: McLeman. Climate and Human Migration: Past Experiences, Future Challenges, 185; Hunt and Mandia. Rising Sea Levels: An Introduction to Cause and Impact, 32. Figures 2 and 3: Images provided by the Author. Figure 4: Image provided through the courtesy of ELEMENTAL. Figure 6: Image provided by the Author, generated with information from: Zerhouni. L’architecture de terre au Maroc; Karmaoui, Ifaadassan, Messouli and Khebiza. “Sustainability of the Moroccan Oasean System,” 2-3; and “Traditional water management in arid and semi arid areas.” Hydria Project. Figure 7: Image provided through the courtesy of Don Hogle. Figures 8, 9 and 10: Images provided through the courtesy of LATERAL OFFICE, Toronto. Figures 11, 12, 13 and 14: Images provided through the courtesy of MIT+CAU+ZUS+de Urbanisten. Figure 15: Image provided through the courtesy of Google Earth Pro.